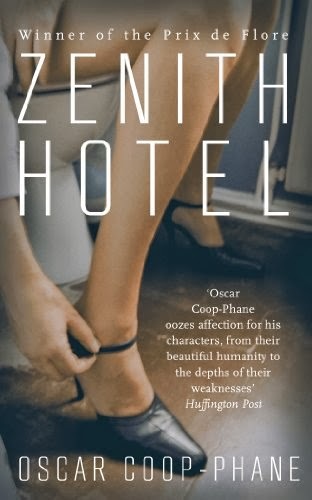 FlutterbyBooks: Zenith Hotel by Oscar Coop-Phane. This is a short snappy book telling the story of a street prostitute working in France. Rather than it being a deep and meaningful book looking at her history, and how it made her turn to prostitution, instead the book focuses on just one day in her life and tells the story of the clients she meets that day. I felt like this book was full of mystery. I was intrigued to learn more about Nanou and the life she leads, yet the majority of the book explains the lives of the men she meets. Each man's story was so interesting and what I wondered as reading was whether it was the true story of their lives, or just Nanou's interpretation as to what their circumstances could be based on her interaction with them. This is quite a dark story, which was really interesting and totally captured my imagination. A definite if you're looking for a quick read which is a bit different from the usual books on your shelf. I'm a street prostitute. Not a call girl or anything. No, a real street whore, with stiletto heels and menthol cigarettes. Narrator Nanou gives a detailed account of her day, from the moment she wakes up with a foul taste in her mouth, in her sordid rented room, until the minute she crawls back into her bed at night to sleep. Interwoven with her story are portraits of her clients. Oscar Coop-Phane invents an astonishing cast of original and deeply human characters losers, defeated by the world around them who seek solace in Nanou s arms. Original and moving, this short book deftly paints a world of solitude and sadness, illuminated by precious moments of tenderness and acts of kindness.